Metolius Pond, a new fishing pond for kids and disabled anglers on the grounds of the old Metolius Hatchery, is now open for fishing. The pond will be stocked regularly with trout from Wizard Falls Hatchery, providing an easier fishing opportunity in an area with no other stocked ponds. “Trout are difficult to catch in this area, as the Metolius River is renowned as a challenging place to fish and is restricted to catch and release fly-fishing only,” said Jennifer Luke, ODFW STEP biologist in central Oregon. “This new pond will give kids and disabled anglers from this area or visiting Camp Sherman a great opportunity to catch a trout. The new pond is also in a very scenic area near Spring Creek and its spawning kokanee and redband trout, with views of Black Butte,” added Luke. Kids age 17 and under and anglers with a disabilities license will be able to fish at Metolius Pond. 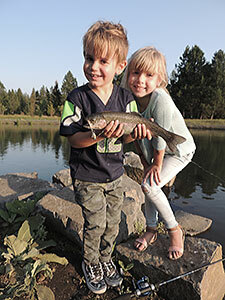 Fishing is free for kids age 11 and under while older kids need the Youth License ($10 for both residents and non-residents; includes fishing, hunting, shellfish and Columbia River Basin Endorsement). Per Oregon Sport Fishing Regulations, the bag limit at Metolius Pond is two fish per day, and the pond is open sunrise to sunset. The Metolius Pond grounds include a parking area (including ADA parking), ADA path and vault toilet. A gravel pathway around the pond will provide easy access for anglers. The Metolius Pond project was funded by the Restoration and Enhancement Board and included improvements to wildlife habitat on the site such as wildlife friendly fencing and planting of native shrubs and grasses. School groups will also be invited to use the site for field trips to fish or learn about stream habitat and kokanee spawning in Spring Creek. Directions to Metolius Pond: From Sisters, drive 9 miles NW on US-20/OR 126 and turn Right (look for the Camp Sherman / Metolius River Recreation Area sign). Veer left at fork and head to Camp Sherman (2.5 mi). Turn right onto Old Fish Hatchery Road (gravel road). Go to end of road to parking area.